Explore Lisbon’s grandiose landmarks and charming promenades during this 4-hour small-group guided tour with tastings. 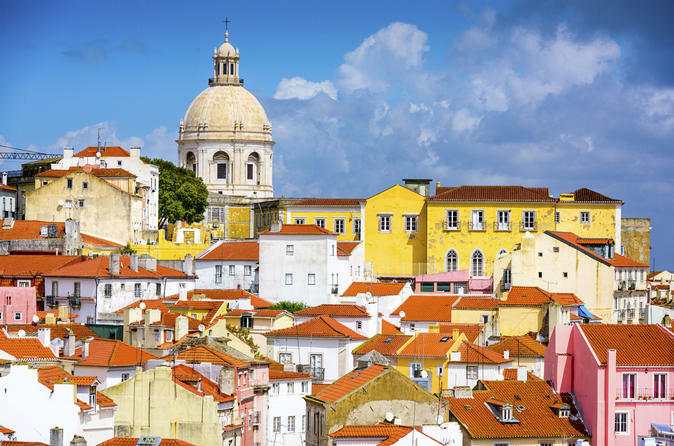 Aboard a minivan, discover the Portuguese capital’s abundance of culture, historic monuments, and famous squares. Learn history alongside your expert guide in the bustling neighborhoods of Chiado, Baixa and Belém. You will see unparalleled views of the city and adjacent Tagus River. Your day ends with traditional tastes of Portuguese cuisine including a sweet pastry, cod cake and Port (fortified wine). Meet your guide at the Hard Rock Cafe in central Lisbon, then buckle-up in an air-conditioned minivan for your 4-hour small group guided city tour. Start your adventure with a visit to Lisbon Cathedral (Sé de Lisboa), the oldest church in the city. Learn how devastating earthquakes, including the Great Lisbon Earthquake of 1755, lead to numerous architectural renovations. Then, observe centuries of history as you see both its Romanesque and Baroque styles. Next, cruise to the city’s highest hill, in the Graça neighborhood. Spend time relishing spectacular views of the city and Tagus River. Then drive to the oldest district in Lisbon, Alfama, known for its Moorish ancestry and the birthplace of fado music. Make your way to the waterfront in the Belém district and cruise the coast of the Tagus River to the Monument to the Discoveries. Listen as your guide tells stories about Vasco da Gama, the most famous Portuguese navigator who helped pave the way for Portugal’s age of global imperialism. After stopping at the UNESCO World Heritage Site of Belém Tower, taste a famous Portuguese pastry called pastel de Belem (pastel de nata). Then visit the Jeronimos Monastery and learn how catholic monks famously created this pastry before the 18th century. Continue on to the Chiado district enjoying monuments along the way like the Basilica of Estrela. Nearby, walk through the Baixa district, known for its nightlife and fabulous squares, including Restauradores, Rossio and Figueira. After your stroll, enjoy a tantalizing glass of a fresh vinho verde, also known as “green wine,” perfectly paired with a savory cod cake. Then, sip a classic Port (fortified wine) as you snack on local cheese. As the four hours comes to a close return to Rossio square where your tour ends.